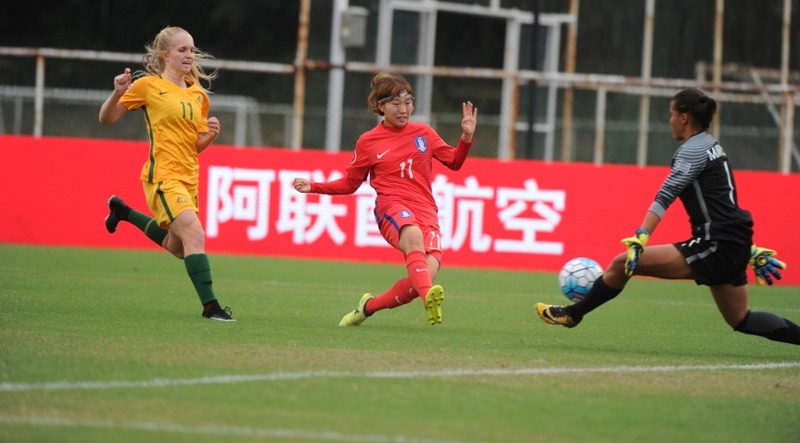 Australia have defeated Korea Republic 2-0 in their opening match of the AFC U19 Women's Championships at Jiangsu Training Base in Nanjing, China. Second half goals from Sydney FC duo Remy Siemsen and Princess Ibini as well as a trio of one on one saves from Jada Whyman helped the Young Matildas claim a vital three points. Taking on former FIFA U20 bronze medalists and AFC youth powerhouses Korea Republic, it was a nervous first half performance by Australia. A tight opening five minutes was marred by the lose of forward Cortnee Vine who received a ball flush to the face. The Newcastle Jets forward eventually walked off the pitch but the concussion protocol came into play and she was subbed out of the game for Emily Condon. The highly technical Koreans took control of the game peppering Australia's goal. Jada Whyman was forced to make one of several 1v1 saves early as Kang Chaerim was played in behind the Australian defence with the Wanderers' custodian making a crucial block. Minutes later it was the woodwork to come to the rescue as Kim Soeun skipped into the penalty area with her strike evading Whyman but not the far post. Korea turned up the pressure late in the half as the Aussies struggled to find the ball and rhythm in their game but Ellie Carpenter made a couple of covering runs to keep the Korea attack at bay. Late in the half Australia had a rare look at the Korean goal with Princess Ibini providing a strong run down the wing before square into the late run of Chidiac but goalkeeper Kim Yealin was alert to the danger. The second half saw Australia commence the match more positively and their key midfielders started to find themselves on the ball. Despite better spells of possession, the Young Matildas were unable to find a way through Korea until the 70th minute when Ibini dispossessed in the midfield before laying off to Chidiac. The Adelaide United midfielder find a shot which was parried away by Kim only into the path of the on rushing Siemsen who made no mistake. Minutes after Korea Republic looked to reply quickly but again they were foiled as Kang's strike rattled the crossbar. Whyman came up big again for Australia in another one on one situation as the Wanderers keeper preserved Australia's lead. She was rewarded late in injury time as the industrious Ibini sealed the Aussie victory with a volley goal in the 94th minute. “It’s a great result. Of course in any tournament you want to start off positively, and that’s what’s happened," said head coach Gary van Egmond. "Performance wise; we have played better, but I think the opposition made it very difficult for us to play the way we want to play. They were very skillful and had some great technicians, but defensively we were solid, and our goalkeeper made some crucial saves." Goalscorer Remy Siemsen was equally happy with the result. "We've worked so hard towards this game especially because we know how good South Korea are, so to get the win was definitely the highlight of this tournament so far," she said post match. "We were definitely ready to go today and we got the three points." Australia will take on 2016 FIFA U20 bronze medalists Japan in their second group match on 18 October 2017.